Is there really a law against feeding pigeons? Tuppence to feed the birds? Well it could actually cost a lot more than that if legal restrictions have been put in place to tackle a pigeon problem. The expression made famous by Mary Poppins more than half a century ago has been given a whole new meaning in a number of cases where bird feeders have found themselves on the receiving end of a hefty fine. While it is not against the law to feed pigeons in the UK, councils do have the capacity to pass their own laws where pigeon populations have become a pest. What is the law on feeding pigeons? Pigeon populations thrive by being repeatedly fed by people. While they can also scavenge for scraps, deliberate feeding is the main problem in booming pigeon populations. 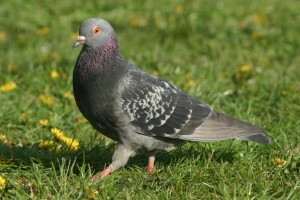 Pigeons breed rapidly and roost along with many other birds. The numbers of pigeons that can gather together in a certain area causes problems with the volume of unhygienic faeces they leave behind as well as their intimidating demands to be fed. The most effective way to remove pigeons from a particular spot is through reducing food and installing anti-pigeon measures. Pigeon problems will continue to persist when certain people are insistent on feeding the birds despite neighbours’ concerns. However, as birds and their eggs have protected status in British law, councils are taking matters into their own hands, using bye-laws to get around pigeon problems. One example, that is widely used, is fining people for leaving food waste in an area affected by pigeons, rather than being seen as food left for the birds to eat this is treated as litter and fines swiftly handed out. So, watch out emptying the crumbs of your pasty on the city streets for pigeons to hoover up. In cases of persistent pigeon feeding, where the birds are causing a problem to neighbours and the community, a council can take action by applying for an order to target the behaviour, such as a community protection order. The most high-profile anti-pigeon action has got to be at London’s Trafalgar Square, which was historically home to vast numbers of pigeons. There were so many pigeons at the historic site, it was deemed an uncomfortable experience to visit – and this, along with the £140,000 bill to repair the damage done to Nelson’s Column by the birds led to a bye-law being introduced to ban pigeon feeding. Anyone daring to feed pigeons in Trafalgar Square now does so at the risk of landing a £500 fine. While pigeon feeders continue to sow the seeds of despair among families and businesses blighted by these pests, those not protected by littering laws need to find a solution of their own. Make sure you stay on the right side of the law and call for expert advice to tackle pigeons at your property. Contact total Bird Control today.